I think I made a tactical error yesterday, when I decided to spend the majority of the day putting Ikea furniture together and shuffling things around in the kids' rooms rather than just goofing off. In my defense, the weather was decidedly unsummerlike, which quashed my idea of having an extended lunch outside with Hubby and I relaxing with beers while the kids ran around and played in the yard. Instead, they played inside while we sat in the dining room and tried not to notice the havoc they were creating in the living room- two rooms which in our house are about two steps apart. Still, it wasn't a bad day. We had fun playing with the kids. But both kids seem to have arrived at a difficult and defiant phase at the exact same time, and by the end of the day my patience with small blonde girls yelling "NO!" at me was pretty much gone. And yet, going back to work today was not the respite it sometimes is. I have a system outage to manage this weekend (we need to do some maintenance), and a production system roll out planned for Monday- the actual work is mostly being done by other people, but I am "quarterbacking" both events, i.e., making sure that everything that needs to be done gets done when it needs to be done, and I'm handling all communications with the rest of the company. And of course, there are roughly 4-5 other projects that are running and need varying amounts of my attention to keep them on schedule. None of this is unusual, but it isn't exactly restful, either. Neither is it particularly invigorating- my favorite stages of projects are the very beginning, when I'm figuring out how to make all the pieces fit together, and the very end, when I get the satisfaction of seeing something completed. In between, the work can sometimes feel satisfying, and sometimes feel like a slog. This week, it was the latter. As I mentioned last week, it seems like work and home are ganging up on me these days. I am not sure whether it would be better to plow ahead and concentrate on getting things crossed off my various to do lists or to just put off as much as I can and spend some time relaxing with a book. All I know for certain is that I don't have the energy to write the things I want to write- I have two or three half-finished posts in my drafts folder, which is unusual for me. I usually just write one post through to the end. I have a half-finished guest post for A Gai Shan Life sitting in my Google Docs (I'll get it done soon, Revanche! I promise!) And I have a longer writing project stuck at roughly 90% complete. Usually, these writing projects would invigorate me, but for some reason, right now, I'm struggling to finish anything. Except rambling self-pitying posts about how burned out I am, I guess! I think I need to convince my husband to have a bonus Thursday Night Beers with me tonight, and just chill out. 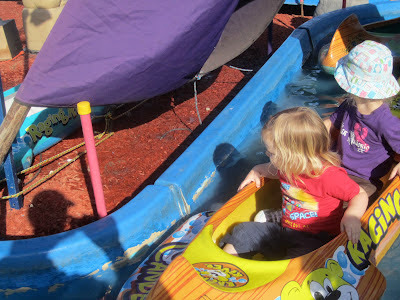 The picture is from last week's trip to the fair. I have no idea what they are looking at- it was a pretty lame ride. The trucks were waaay better. It is hilarious how putting a steering wheel in front of a small child convinces her she is driving. The look of glee on Petunia's face while she "drove" her truck around the track was worth the price of admission- and then there was the cotton candy (for Pumpkin), ice cream (for me and Petunia), and "Australian Battered Potatoes" (a.k.a potato fritters, for Hubby). So even though last week's fair outing was part of the work-life pile up that is leaving me in need of some recuperation, I'm glad we went. That is part of the problem, really: all of the things that are exhausting me right now are good things, which I want in my life. I just need to get them to space themselves out a bit better! Mine are almost exactly 2 years apart so we get the iffy stages at the same time (eg18 months, 3.5), and because of mix in personality/character, even the equilibrium stages are dodgy most of the time. In a small living the 'divide and conquer' option is futile. Understand completely. With summer, there have been a lot of 4-day weeks for various reasons. I do fun things on the off days (water parks, multiple pool trips, etc.) but there is a bit of a stack-up upon return. And the days off aren't exactly restful with the little ones either. But at least they're cute! When I read your post title, I thought you were talking about the "suboptimal spacing" of your kids' births - because that's actually the gripe I'm having with the universe right now. Mine are 23 months apart (4.5 and 2.5) and right now it is totally brutal. Like @Paola said about getting the crappy disequilibrium stages at the same time. I'm not a fan! So I totally feel you about the best laid plans and too many good things happening all.at.once making them not always feel so good. Must remember to take the long term view. I really hope you do the guest post for Revanche. I noticed that a long of younger women who are contemplating kids and career are already scared of the future balancing act. If I read through comments, mostly by other 20-something women, there seems to be a consensus that you can't do it "all". I think a more thorough discussion is needed -- defining "all" and not being scared by having a career and kids, etc.. and you're the perfect person to write it! I'm working on it! The fact that so many 20 somethings are scared by the career/parenthood thing is sad, and one of the things that bothers me the most about our current cultural narrative on motherhood in general and working motherhood in particular. But perhaps I shouldn't start ranting about that here! I'm putting my fingers in my ears and blissfully ignoring you all about 'suboptimal spacing' as my girls will be exactly 3 years apart and likely going through the bad parts at the same time too. Aaagh. 2.5 is kicking our butts, BTW. It is getting slightly better, though and I think it's 20x worse when she's tired or hungry so we're getting smarter, albeit slowly. Didn't mean to scare you! Once your older daughter gets past 3.5 it should be generally all good. Then things might get ugly again when the younger reaches 2.5. Rinse and repeat. Our 2.5 year spacing has mostly been pretty good. But my goodness, the last week or so has been a challenge! They almost seem to be feeding off of each other's defiance. We'll have to get a bit more clever with how we respond, I think. I'm late to the party on this one - reading blogs has fallen by the wayside in my current state of "attack" by work, summer activities and poor child behavior. The 3-year old is in an "I can't" phase of not wanting to do anything for himself and the 5-year old seems to have lost all power to control herself or listen when I'm around. I'm hoping it is a combo of exciting summer fun plus anticipation of fall changes (kindergarten, etc)...but add in a few nights of solo parenting this week and the 3-year old's refusal to sleep before 9:30pm...and I am just BARELY holding it together. Thankfully, work should be less pressure filled in August and our calendar is less jam-packed then, too!